On Friday, make some space in your wardrobe by extracting any winter coats you no longer wear or want and donate them to Wrap Up London. Volunteers will be at Kings Cross, Waterloo, Paddington, London Bridge, Charing Cross and Victoria between 6.45am and 11am to collect your old 'gently worn' coats – TfL are supporting the drive so look out for their collection points when you're passing through stations this week. Your coat donations will be sorted and distributed to vulnerable people via women and children’s shelters, homeless shelters and elderly centres across London. The first city-wide coat collection has been organised by Hands On London which aims to bridge the gap between would-be volunteers and community and charity groups. It's especially interested in making flexible volunteering opportunities available to busy, professional people. Want to give something back? Find out about becoming a member. Interested in what Hands On London is up to? Like them on Facebook. 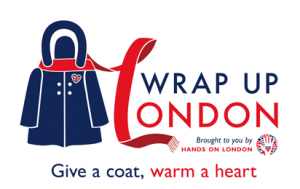 Donate a coat to Wrap Up London on Friday 4 November between 6.45am and 11am. Friday is also St Mungo's Woolly Hat Day.